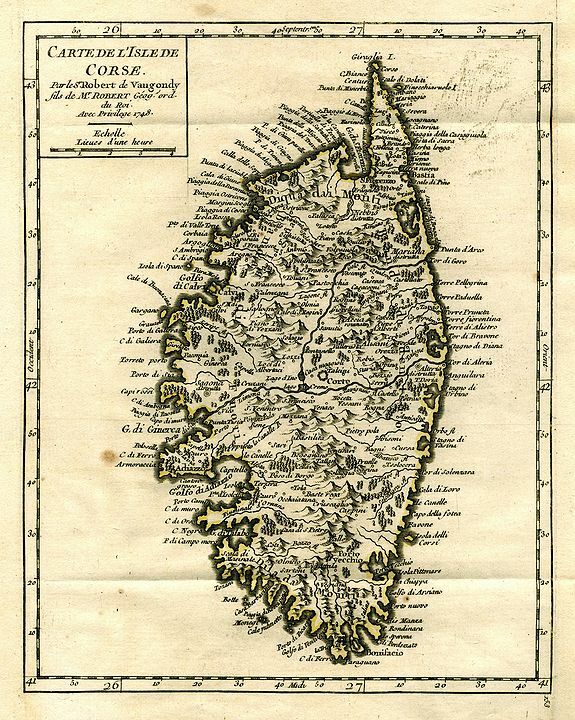 VAUGONDY -Carte de l'Isle de Corse. VAUGONDY, R. - Carte de l'Isle de Corse. Carte de l'Isle de Corse. - VAUGONDY, R.
Title : Carte de l'Isle de Corse..
Map maker : VAUGONDY, R.. Size : 8.3 x 6.5 inches. / 21.0 x 16.5 cm. Description :Charming and very detailed map of Corsica. Shows towns, rivers, lakes, woods, mountains, bays, and islands. Condition : Good impression, some light uneven toning. A few small spots. Top right corner with printers smudges. Crisp folds.